Sorry... the 2017 Toyota Land Cruiser is no longer being sold as new. Instead, take the first step to a great deal on 2019 Toyota Land Cruiser with a free price quote! The 2017 Toyota Land Cruiser is a flagship SUV that seats a total of eight passengers. It competes with the Ford Expedition and Chevrolet Suburban. This year, it remains largely unchanged. Overall, the Land Cruiser has a utilitarian, rugged appearance. It offers plenty of illumination with LEDs for the headlights, daytime running lights, and fog lights. Skid plates, a roof rack, front and rear tow hooks, front and rear mudguards, a power moonroof, and 18-inch alloy wheels come standard. The Land Cruiser is powered by a standard 381-hp, 5.7-liter V-8 engine mated to an 8-speed automatic transmission that produces 401- pounds-feet of torque. Fuel economy for the Land Cruiser is an EPA-estimated 13/18 mpg city/highway. It has a maximum towing/payload capacity of 8,100/1,320 pounds. Inside, the Land Cruiser has a premium leather-trim interior with woodgrain inlay, a 40/20/40-split folding second-row seat, and 50/50-split folding third-row seat. Maximum cargo space is 81.7 cubic feet with the second row folded and the third row removed. The center stack features a standard Entune multimedia system with a 9-inch touchscreen, Bluetooth connectivity for phone and audio, Siri Eyes Free Mode, a USB port, and a JBL premium audio system. Standard features include quad-zone automatic climate control, heat/ventilated front seats, remote keyless entry, and push-button start. A rear seat DVD entertainment system is available as well. 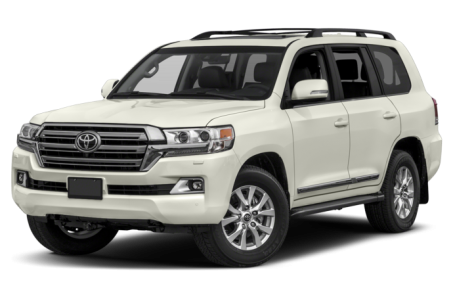 The Land Cruiser comes standard with Toyota Safety Sense-P, which includes a pre-collision system, pedestrian detection, lane departure warning, and adaptive cruise control. Free for the first year, Toyota is offering its Safety Connect services that includes emergency assistance, stolen vehicle locator, roadside assistance, and automatic collision notification.